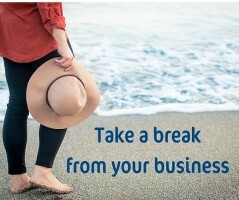 How often do you take a break from your business? A real break, where you don’t even think about your to-do list or check your emails. I am always surprised at the amount of women who say they never take a break, whether that’s a small tea break in the day or going on a holiday, they are always ‘switched on’ to their work. If you work from home, it’s sometimes difficult to unwind during your non-working hours. Some women don’t feel they can take time off as their business might lose momentum, they might miss an opportunity or a sale. When you run the business, and maintain all the operations yourself with no assistance, it can seem easier to overload yourself to do it all and work long hours, or every day of the week, than to attempt to get help so you can step back a little or have some time off now and then. Let’s face it, having time off when you felt like it was one of the reasons for working for yourself in the first place, wasn’t it?! There have been times when this is me, working seemingly constantly, and if I wasn’t working then I was definitely thinking about work. But since making that decision to change the way I schedule my work so I can have more time to myself, I absolutely value those breaks. When I take a holiday, I completely switch off from my business and always return raring to go with clear direction and plans. Everyone should take a break occasionally, give yourself the space to have better ideas and get clear on what you do and why, it could change the way you work! Being away from your business (or the preparation leading up to being away) highlights what is really important, where you should focus your efforts and what could be ditched altogether. Not taking a break at all, or often enough, is a certain route to burnout, and then both you and your business will suffer. Having a break can help you get some clarity and realise what’s important to you. You can see the bigger picture, and sometimes see a different perspective to any issues in your business. You will come back raring to go, with some fresh ideas, and feel a little less frazzled. When we switch off, we also remember things that need doing or have some good ideas – like when you get into bed at the end of the day and suddenly remember a call you were meant to make, or come up with a catchy blog title or social media post. Your break doesn’t have to be a full-blown holiday – although that would be nice! – just some time out of your business, get some exercise, a walk outside to un-clutter your mind, or getting a cup of tea in a change of scenery. Sometimes working from a different location can be useful; a change is as good as a rest, so they say. When you started your business, did you ever imagine you would working all day without a break, or a proper lunchtime? Did you imagine that you would never take time off, either for a family holiday or just some time off for yourself to have a day of shopping or lunch with a friend? I’ll guess probably not, so did you plan breaks and holidays in, because you knew you definitely wanted them? Again, probably not, but it’s ended up that way for a lot of women running their own business. Plan it in – schedule breaks into your day, plan to have some evenings or weekends completely work free, a me-time ‘day off’ (or half a day) each month if you can, or schedule your family breaks and holidays into your diary. There might be times when it’s easier or more sensible to take a break, depending on the fluctuations in your work. Adjust your workload to take this absence into account, avoid starting projects right before you are about to switch off for a while, make sure that existing or planned work can be completed in time. Inform your clients to set their expectations on when work will be completed. Let anyone making new enquiries know when you will be able to follow up with them. Tie up loose ends before you go away, and be aware that sometimes this leads to working a little more than usual to fit it in (but you do get a break as the reward!). Automate what you can, for example a booking process, so people can still book future sessions with you even while you are not there to respond. You might find that this makes it so easy while you are away that you keep it up when you are back. Does any of your work need covering? If needed, arrange for any of your business tasks or client tasks to be covered while you are away, use a Virtual Assistant to take your calls or check your emails for anything that can be responded to on your behalf. This is another thing that you might like this so much you decide to carry on once back. Schedule content on your social media platforms or your blog to be posted in your absence. Don’t forget your auto-responder and advise when you will be returning or when they should expect a response, especially if you will not be accessing your emails while you are away. If you deal with email a lot, it’s important to let people know you are aware you are away and when to expect to hear back from you. Let them know if there’s someone else they should contact in your absence. Carry a notebook so you can jot down all the good ideas that you will have once your mind is free from the everyday tasks of your business. I don’t go away without one, as I always think of things to improve my business when I am away from it. Schedule catch-up time. Remember you need time to catch up with your business tasks, emails and enquiries when you return. If you are taking more than few days off, chances are you’ll need to schedule in some time to catch up when you return. I always block out the first day back to work after a holiday for this reason, and if I’m having more than one day in a week out of the office on client visits or networking events, then I also schedule an evening of work to catch up. Finally… unplug, switch off and relax! If you are working your business around your children, you definitely need to schedule breaks in, as our downtime from work isn’t so relaxing when you’re running around after the kids! Follow us on Facebook and Twitter for more advice and support for women in business, and see our tips on how to create the business you desire alongside raising a family.